It's here! 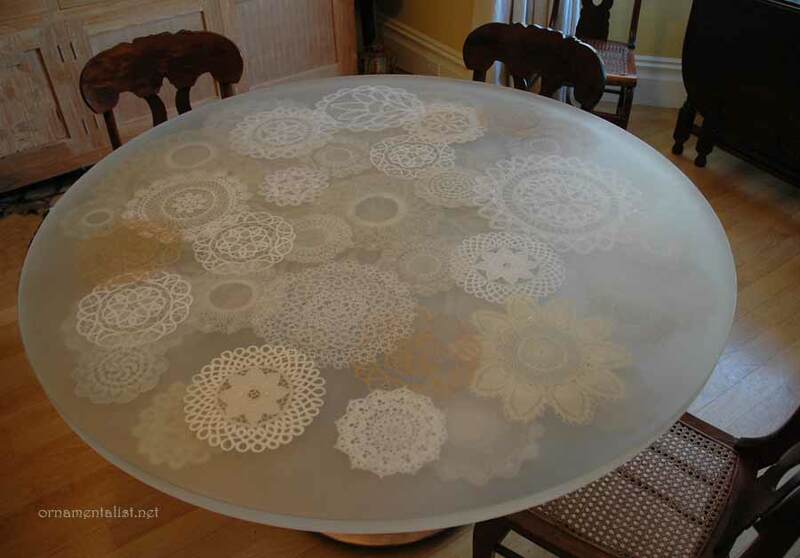 my lace doily table, custom made by my friend Marcia Stuermer of Fossil Faux Studios. 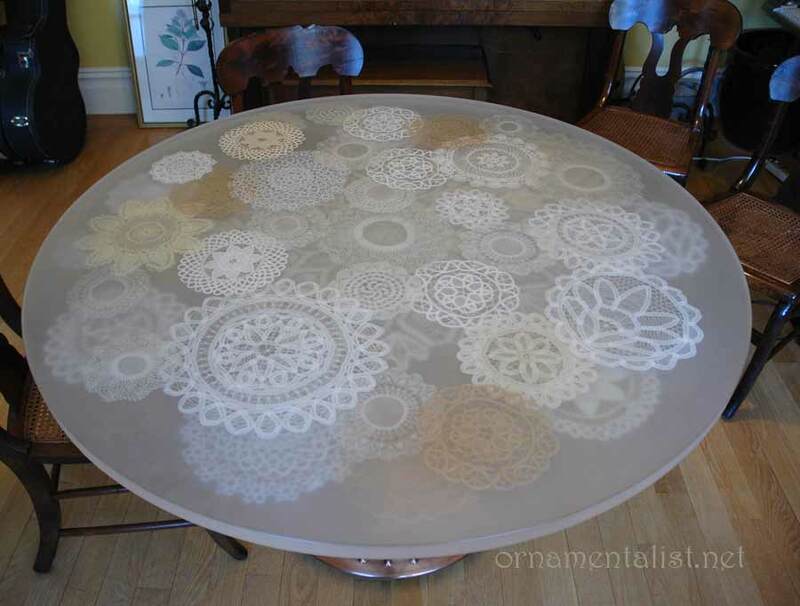 The tabletop is acrylic resin, embedded with lace doilies, many of which were made by my great grandmother. The rest were collected from eBay as well as San Francisco's Chinatown. At 51" in diameter, the table is scaled perfectly to the room, and can seat 6 comfortably. It has a different color and glow in varying light. And it looks great with my late relative lyre-back chairs. I could not be more excited about this. It's perfect! 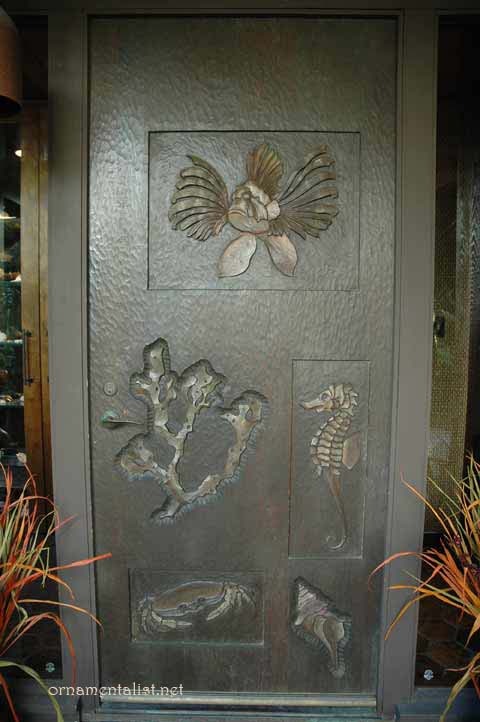 This is a beautifully carved door in Newport Beach, California, by the artist and master woodcarver Mogens Abel, from Laguna Beach. 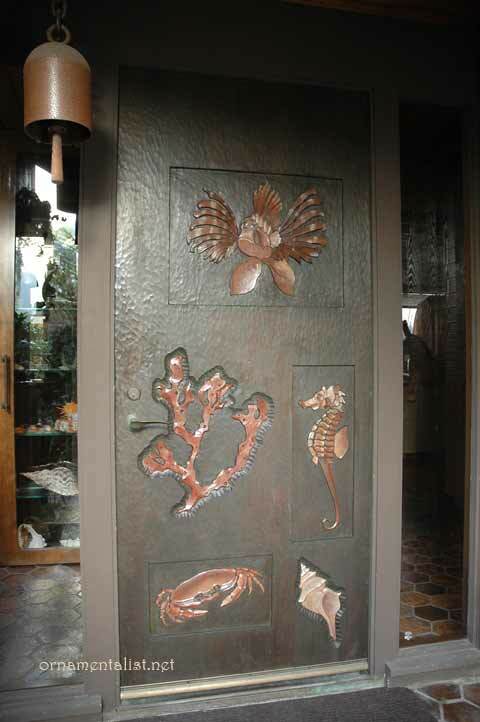 Everyone remembers this door as having been really brightly colored when it was new. I sure didn't mind seeing it aged and darkened, but it also became filthy, especially after the recent fires in Southern California, and had a fair number of gouges. The wood had become very dry and the colors faded. Last week, as the door approached 40 years old, I cleaned and oiled the wood, and re-stained the ornament. Just cleaning the surface revealed a lot of the color and detail. 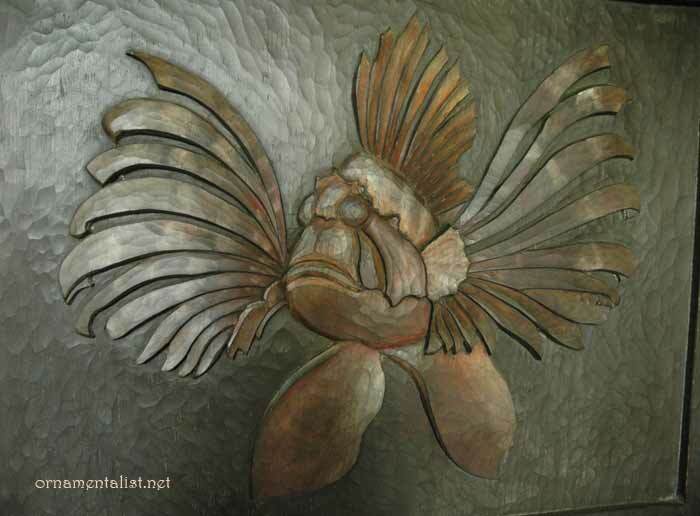 I remember visiting Mr. Abel in his studio in the mid 1970's; he showed me how he made this work, carving it in redwood, or fir, or some other California native wood, and then "staining" the elements with thinned artist oils. There were enough traces of the original paint that I was able to match the colors. 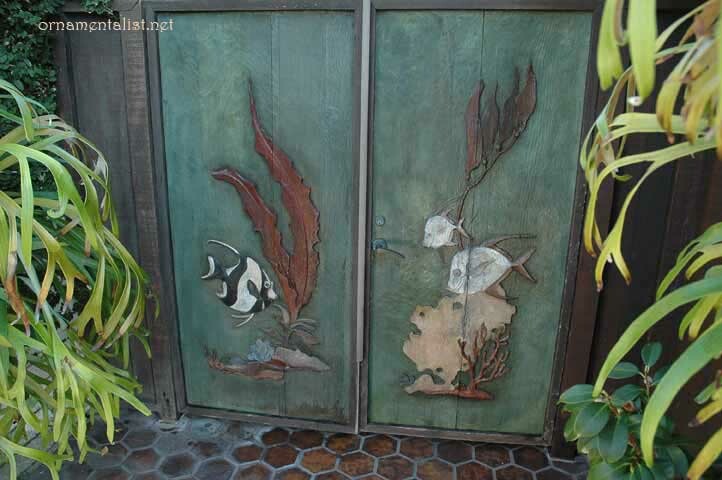 I also mixed up a seaweed green to touch up the gouges and scratches in the door. 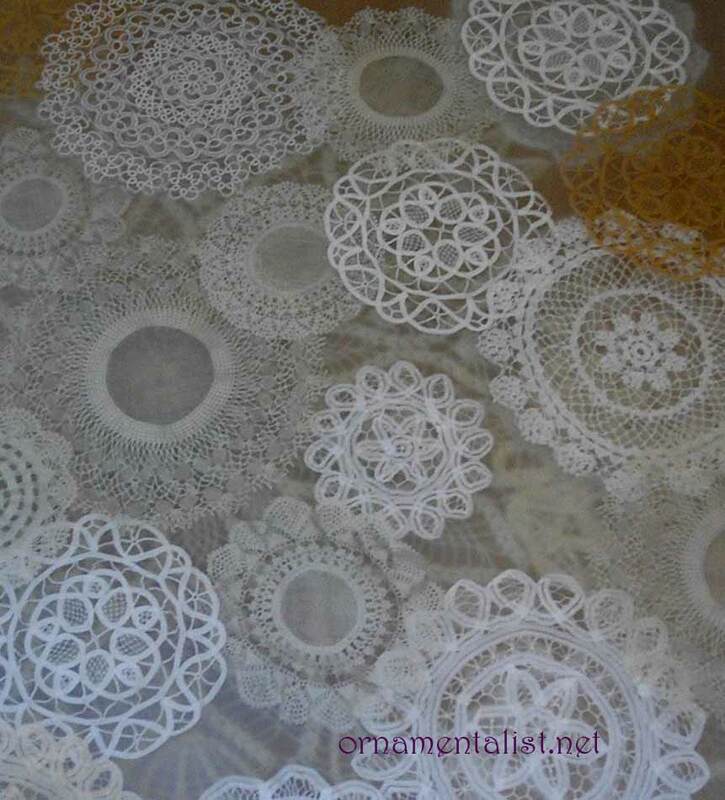 In the next few weeks much of the color will be absorbed into the wood. A light oiling every year or so keeps it in good condition. Abel also carved these redwood gates in 1972. After some repairs had been done about 5 years ago, I recreated the polychroming and left it fairly rough. 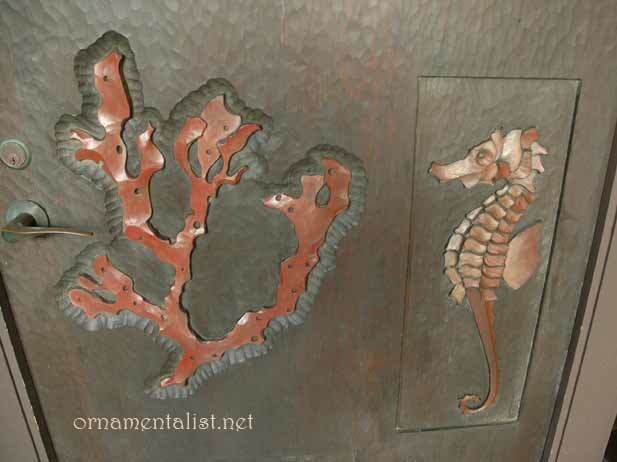 These have since weathered and worn as intended by the artist.